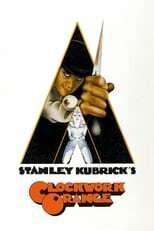 Kubrick reportedly banned his own film in the UK from being seen after a short release because there were copycat killings and rapings in which the film was being scapegoated for, which of course is stupid as any gangster film brought out in that period could have easily have been blamed for influencing such behaviour. The doctor standing over Alex as he is being forced to watch violent films was a real doctor, ensuring that Malcolm McDowell's eyes didn't dry up. I wish I could give this film a 6 out of 5 just for a revolutionary, directorial look, where Kubrick has many bad scenes accompanied by jolly music; where if we are to experience them as we should, we have to do it consciously, by realizing they are bad, and not because the director tells us so through the use of music and images.